Dugan came in from the Sanford Orlando Race Track but also raced at Palm Beach in Florida, Wheeling in WV and Corpus Christy in Texas. He raced until January of 2009 and raced 120 races races. He was very good getting up to AA level quickly while in Corpus but when he was moved to other tracks he didn't do quite as well. He still raced for a long time. He raced at 71lbs and was 4 years old when he came to our adoption group. Dugan was born on November 24th of 2004. He passed his cat and small dog tests easily. Dugan was a very outgoing happy boy. 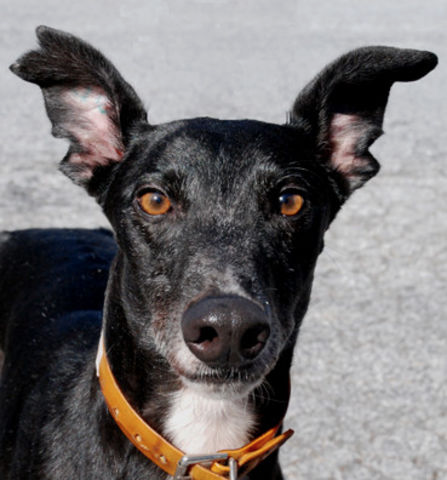 Dugan is a handsome black boy that has the tip of one ear missing. We are guessing one of his littermates got it when playing as a puppy. When he arrived he was very fascinated by the handsome boy in the mirror and would kiss the other dog standing there. Dugan's sire was Clappin Thunder and his dam was FMC Lotsofheart. Dugan had a wonderful life with the McManis family of Easley and was a wonderful boy. He was their first of several greyhounds for them and he had several cats he lived with too. Dugan even helped foster other greyhounds for Greyhound Crossroads. He passed away suddenly in June of 2016. RIP Dugan!